When I first started cooking, enchiladas were one of my favorite go-to recipes in my limited recipe box. They’re fairly quick to put together, and they have a lot of wow factor for a new cook. There are also tons of different ways to make enchiladas! 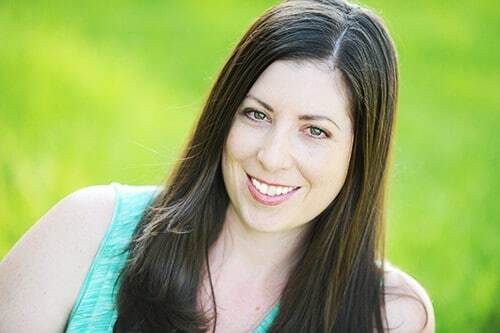 My favorite enchiladas are made with ground beef, corn tortillas and red chile sauce, but my husband likes sour cream chicken enchiladas. Since I have been making most of my favorite dishes lately (thanks to my pregnancy cravings), I decided to whip up my hubby’s favorite enchiladas this evening. 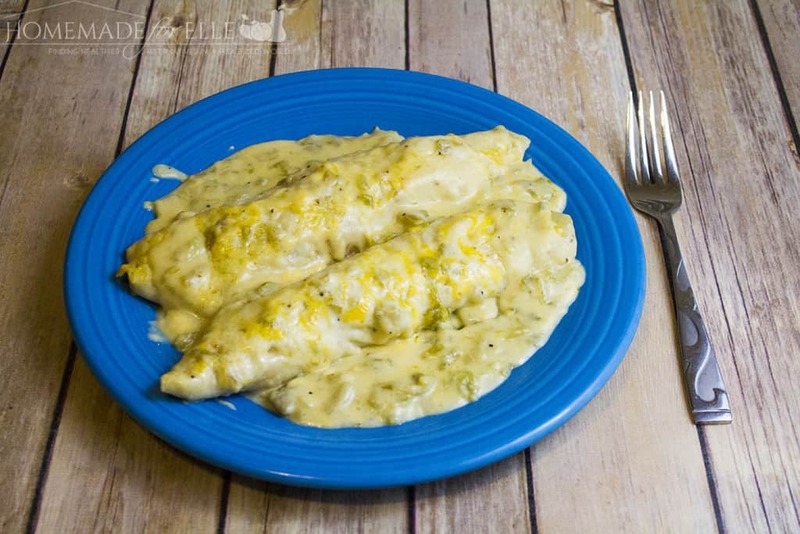 These sour cream chicken enchiladas are super creamy and cheesy. I’ve also made them sans the cream of anything soup mixes, instead opting to create my own homemade roux with chicken broth. It only adds on an extra minute or two of cooking, but pays off tenfold in flavor. 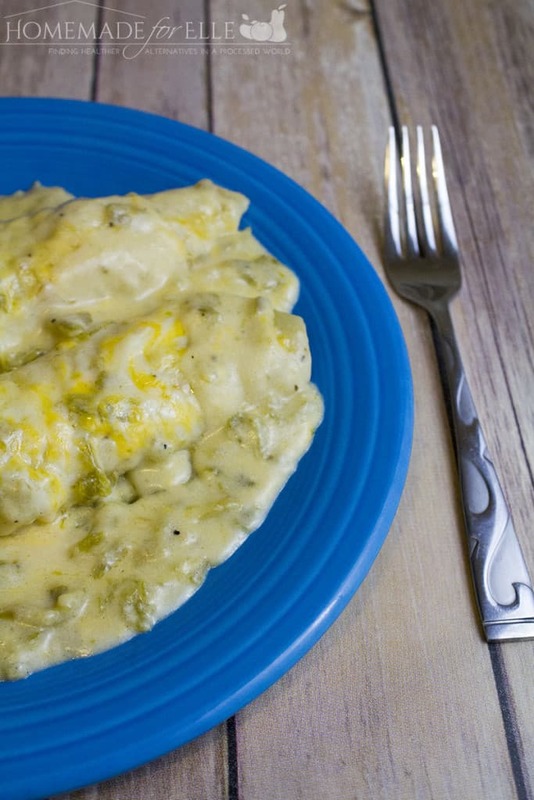 One other tip on these enchiladas: the green chilies are added as the last step in the sauce. 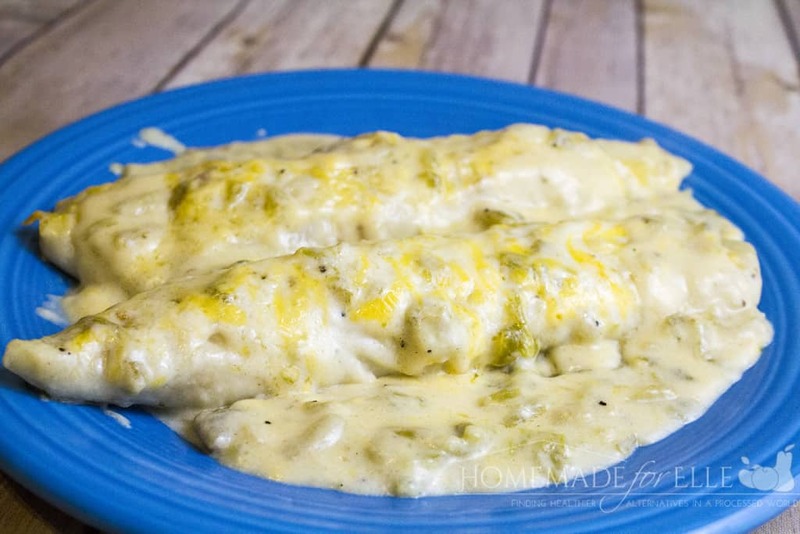 If you happen to be cooking for children or individuals that don’t like spicy food, you can divide the sauce in half (or a third, or whatever portion), and pour the sauce without chilies over a portion of the enchiladas, before adding green chile to the rest of the sauce. Warm olive oil in a saute pan, over medium heat. Cut chicken breasts into small pieces, season with cumin, salt and pepper, and saute in olive oil until cooked through. Warm tortillas in the microwave for 30 – 60 seconds, until pliable. Add 1/8 cup of cooked chicken to the center of the tortillas, and top with 2 tablespoons of shredded cheese. Roll tortillas and place seam-side down in a greased casserole dish. In a small saucepan, melt butter over medium heat. Sprinkle in flour, and whisk to form a roux. Slowly add in chicken broth, whisking constantly until incorporated and no clumps remain. Remove from heat. Add in sour cream and diced chilies and stir to combine. Add salt and pepper to taste. Pour sauce over rolled tortillas. Top with remaining cup of shredded cheese. Here’s a quick video that shows the different steps, if you like visuals! As i am on a special Dietary menue. that requires me to track my food not having nutritional breakdowns. On recipes. Makes it hard to try new ones yes i could figure it out , but that is a lot of work to break down the whole me.